When June Helm first came north in 1951 it was as a volunteer schoolteacher in the tiny Mackenzie valley community of Jean Marie River (see map). Armed with a recently completed Master’s degree in Anthropology (her field work for this degree was from work in a small town in Mexico) she found, anthropologically speaking, a rich, untapped resource in the isolated Dene of the Northwest Territories. 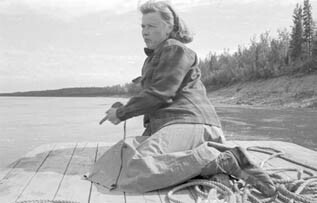 Her anthropological research in Jean Marie River formed the basis not only for her doctoral dissertation (1958 University of Chicago) but also for her 1961 book The Lynx Point People: The Dynamics of a Northern Athapascan Band. She quickly gained a well-earned reputation among anthropologists as one of the leading experts on the northern Dene. In 1959 Helm’s anthropological research in the north shifted from a general interest in the Dene to a more focused work among the Tłı̨chǫ (Dogrib) Dene. The Tłı̨chǫ, many of whom became her good friends, were to become her life’s work over the next three decades. Her studies of Tłı̨chǫ ecology, kinship and demography resulted in two of her best-known books Prophecy and Power Among the Dogrib Indians (University of Nebraska Press 1994) and The People of Denendeh: Ethnohistory of the Indians of Canada’s Northwest Territories (University of Iowa Press 2000). In 1960 June Helm joined the University of Iowa’s Sociology and Anthropology Department. In 1969 she was instrumental in creating a separate Anthropology Department and served as its chair on several occasions. She suffered a severe stroke in 1989 but continued to teach until she retired from the university in 1999. In declining health during the early 2000s, Helm began to organize her field notes, photographs, and audiotapes – almost fifty years of research materials – to send north as a donation to the NWT Archives. She recognized the value this information would have for future generations of Dene who will find much to ponder in this rich resource from their past. June Helm died at the age of 79 on February 5, 2004.